Q: Why is there fog on my pond in the mornings? A: A misty morning fog conjures a sense of mystery—but why the fog appears isn’t so mysterious once you understand what it is and how it forms. Fog is simply a concentration of low-lying water vapor in the air. In the fall, these tiny liquid water droplets often form over bodies of water like your pond or lake. Fog forms when cool air and warm water meet and, more specifically, when the difference between the temperature and the dew point is less than 4° Fahrenheit. You see, in your pond, the water, heated by the sun, stays warmer than the air temperature during the cool night. When the cold layer of still air settles over your pond, warm water vapor from the pond evaporates, entering the cool air above it. The cool air then traps the concentrated water vapor and fog forms. In the morning, as the sun heats the air and temperatures rise, the water vapor evaporates and dispels. If you don’t like fog and prefer to use your pond early in the morning before the misty stuff dissipates, consider installing an AquaStream™ Fountain. 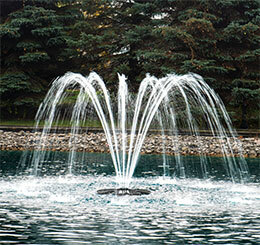 A fountain adds oxygen to the pond—but that’s not all. It also creates movement above the water, which prevents cool air from settling on the water surface. This will help prevent fog from forming. Pond Talk: Are you a fan of fog on your pond or lake? Why or why not?